Blueberry Cove Beads is a beading subscription from Canada. Every month they ship beads and supplies and post a challenge incorporating one or more items from the box. If you choose to enter the challenge, you can share photos of your project and may win your next month’s box free! The Products: A curated selection of beads and findings centered on a theme. There isn’t a traditional information card with this box (i.e., you don’t get an item list). This month there was an issue with the printer and the information card looked a little different. There was not a challenge this month. A note on prices: Items like this can come from a variety of different suppliers at many price points depending on how many you buy, etc. Even different colors of the same size and shape of glass beads are priced differently due to materials needed to make the colors! So I have opted not to provide prices in this review. I guess part of cottage life is sitting back and relaxing and drinking wine? Anyway, you’ll usually get a few charms in various metal tones in this subscription. These have a silver-tone finish, although, I don’t know what the actual metal is (seems most charms are a lead-free “pewter” alloy these days). These are a good size to use in a charm bracelet. These are fairly large, with reasonably large holes. I don’t have a good idea for them yet but I really should start looking for inspiration because I have a TON of porcelain beads in my stash. I do very much like the flower pictures and color scheme of these, though. Here is another charm, I guess this is a park bench? My parents used to own a bunch of land and they had a few of these out and about where you could sit and watch birds and deer and such. So I can see the connection to cottage life. These are cute and very lightweight. I think they could work as closures for wrap bracelets or could be used in mismatched earrings. I guess these are more like cuckoo clock charms? Anyway, they have an oxidized brass finish and moving dangles, which is kind of fun. I used these in a bracelet, which you can see below. I often have trouble coming up with ways to use wooden beads (another thing I have a ton of in my stash), but I thought these looked quite nice with some of the gemstone beads. So I used a lot of them in a bracelet (see below). This is probably best used as a necklace centerpiece. I have a bunch of mixed metal owl, acorn, and leaf charms in my stash that I think would be fun to include with it for a woodland-themed necklace. These are pretty small, maybe 6mm? (I didn’t measure, that’s an estimate.) I thought they provided an interesting contrast with the gemstone rounds since they are the same size but different colors/textures. So I used a few of these in a set of bracelets I made this month. Here are the last charms for the month; these also have an oxidized brass finish. I used some of these in a bracelet this month but I have a few left over if I want to try something else with them. These are fairly dainty despite being thick(ish) metal. You’ll usually get a few strands of accent beads, most often rounds. These are higher in quality than some of the ones we have received in the past. They have a matte finish and are not dyed or painted (the green color appears throughout the glass, as far as I can tell). I haven’t used them yet, but I have a lot of similar colors in my stash that I can coordinate with them. 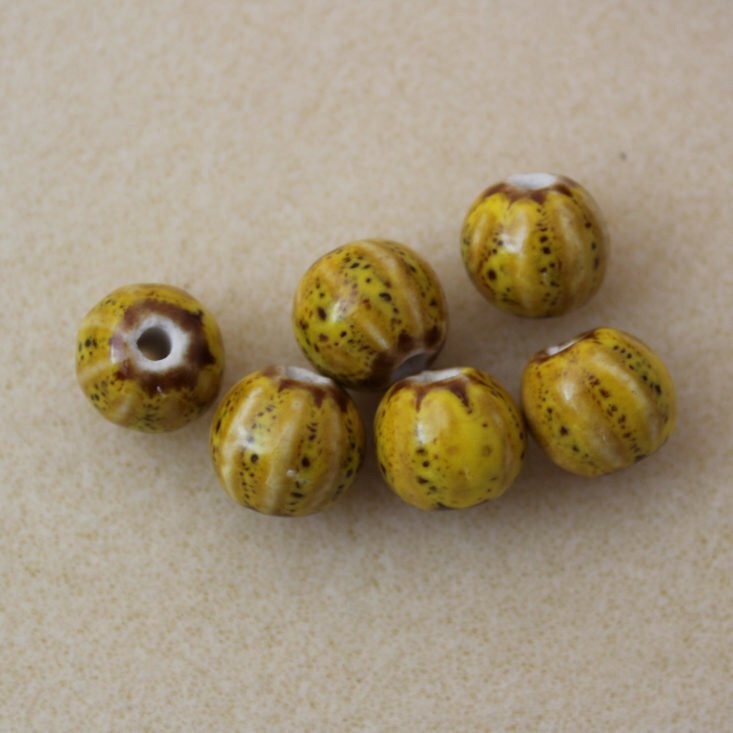 These are smaller than some of the other accent beads (you get a better sense of that in the bracelet pictures below). I used some in my stack of bracelets but have a lot left over. I have no idea what material these are, probably a jasper (or maybe an agate). They are definitely some kind of stone. I really liked the way they looked next to the wood beads and used most of them in my project this month. Here are some bracelets I made this month. I wanted them to have a bit of structure so I used memory wire instead of another stringing material. However, instead of making a coil, I cut them into wrist-sized lengths, rounded the ends into loops, and added clasps. If these look small, they are – I have pretty small wrists and I didn’t want them to be too loose. Not sure I’d do the cuckoo clock charms the same way next time as they look a little awkward here, but live and learn, I guess. Verdict: I did not calculate a value here because it is hard to find similar items when you don’t know the precise materials the beads are made from (I do wish there was more information on the card that comes with the box, in case I find something I’d like to order more of). There were 13 items (if I counted right) so you are paying about $2.08 an item once you factor in the cost of shipping. I think that is reasonable, especially since there were some gemstone and ceramic beads and a ton of charms. Members are billed on the 3rd of each month and boxes are mailed out around the 9th of the month. Sometimes leftover monthly boxes show up in the Blueberry Cove Beads shop and they occasionally have sales, too! Value Breakdown: At $27 for this box, including shipping, you are paying about $2.08 per item. Check out all of our Blueberry Cove Bead reviews and the Craft Subscription Box Directory for more great craft supply and DIY project boxes! What did you think of the September 2018 Blueberry Cove Beads? Do you subscribe to any beading or craft boxes? How do subscribers rate Blueberry Cove Beads? Do you subscribe to Blueberry Cove Beads? Add your rating now! The blue and white flower beads remind me of my grandmother. "I think a lot of people also cannot stand the labeling/marketing of products as "non-toxic" too. :)"
"They also don't offer you the same add on items that are in your box, so you don't need to worry about doubling up." "this looks great...I can't wait.. my first box will be may, I hope it's a good one..."